Carcharoth (S. ‘The Red Maw’; also called Anfauglir, ‘Jaws of Thirst’) was a Wolf of Angband and Guardian of the Gates of Morgoth’s Realm in the North. In origin, he was a cub of the werewolf Draugluin; but at an early age, he was taken by Morgoth, who feared the power of the great HoundHuan. It was said that the great Hound would only fall to the greatest Wolf who ever lived, and so Morgoth bred Carcharoth to be the bane of Huan. In Morgoth’s care, he was fed the flesh of Man and Elf and raised into evil ways, his greatness surpassing all other wolves. 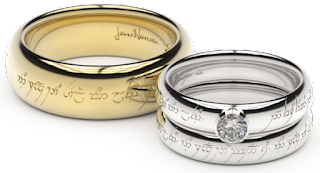 When Beren and Lúthien came to Angband, they were challenged by Carcharoth, guardian of the gate; but Lúthien cast a spell on the wolf, putting him into a temporary state of sleep. Once they had recovered the Silmaril from Morgoth’s Iron Crown, they found the beast had awoken and would not be enchanted a second time. Beren, attempting to ward off Carcharoth with the power of the Jewel, lost his hand – and the Silmaril – to the great wolf. But the Silmaril, which burned the flesh of the wicked, drove the beast mad with pain. Carcharoth fled, ravaging the lands in his path, until finally he came to Doriath, breaking through the ring of enchantment that had been set upon the land. 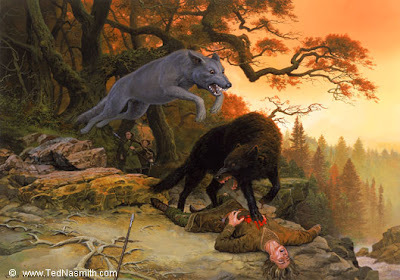 He was caught in the Forest of Neldoreth by hunters from Menegroth, and in the Hunting of the Wolf, slew both Beren and Huan (thus fulfilling the prophecy), though he was in turn slain by the great Hound before he died. Upon his death, Carcharoth’s body was disemboweled and the Silmaril recovered.